Web Design - Page 2 of 4 - io design & illustration, inc.
Our website design services focus on WordPress implementation and customization. We have found the WordPress platform to be versatile and economical for clients needing: content management, class registration, low volume shopping carts, photo slideshows, social media connections and blogging capabilities. Our hosted sites are on solar powered servers. Below are examples of websites designs. Each workshop listing includes complete information on the class and the ability to register from the post. 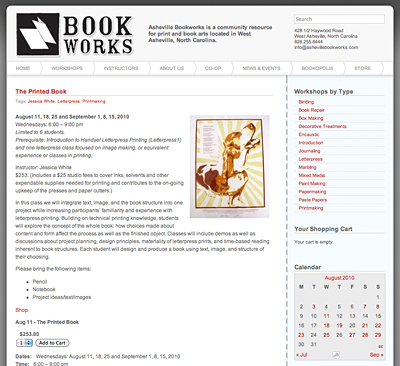 BookWorks is a community resource for print and book arts located in West Asheville, North Carolina. Through classes, exhibits, lectures, and annual events BookWorks has become a premier gathering place for individuals with an interest in handmade books, papermaking, printmaking, and letterpress in the Southeastern US. We have had the pleasure of working with them on their website as they have grown and their needs have changed. The BookWorks site is the most complex WordPress site we’ve completed to date. It incorporates blog style studio updates, static information pages, a shopping cart for online workshop registration, calendar of events, as well as instructor bios and separate areas for co-op members and their annual BookOpolis festival. It was essential that people visiting the site could obtain information regarding upcoming workshops and events in a variety of ways. Upcoming workshops are listed in chronological order on the “Workshops” page, with listings dropping off after they have occurred. A visitor can select to view workshops by type. 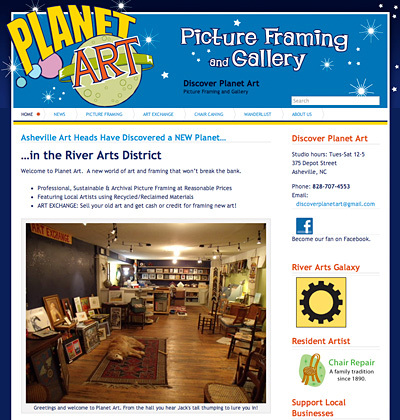 Examples: box making, encaustic, letterpress, papermaking, printmaking. The sorted workshops are presented in chronological order with older classes dropping off as they occur. The sidebar calendar incorporates rollover features to quickly view what workshops and events are happening on any particular day. Click through directly to the related items is enabled. The bio for each instructor includes a link to view all workshops taught by that instructor. Again presented in chronological order with past classes dropping off the list. Having multiple ways an interested student can access and cross reference workshops takes advantage of the different ways people search for information. Some come to BookWorks wanting to learn a particular skill, so sorting by workshop type is an ideal method for them. Others may be visiting Asheville or be hosting visitors to Asheville on particular days, so accessing the information via the calendar is ideal. And others may have taken a class with a particular instructor and desire to learn from them again. Registration for workshops is accessed directly from each description listing. The site also includes a “Store” page where BookWorks can offer support materials for classes. BookWorks staff has embraced the new site whole heartily, actively posting news about upcoming events and daily studio activities. The new site has provided them with the tools to communicate in an engaging way with others interested in book arts and related fields. The site remains current and relevant.